Make a magical moment with this exquisite diamond ring from the Enchanted Disney Fine Jewelry collection, inspired by Snow White. 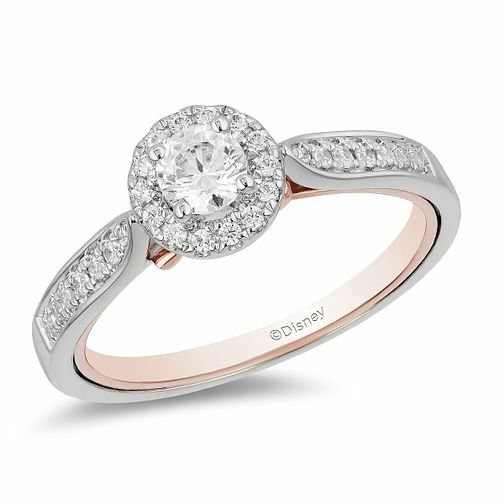 Crafted in chic 9ct white and rose gold, this wondrous style features a gleaming round diamond centrepiece complete with glistening stone set halo. Sparkling from head-to-toe, the stones carry onto the shoulders. The gorgeous gallery presents the rose gold contrast, with a cute bow accent. This ring will surely prove she is your princess. The total diamond weight of this ring is 0.50ct.